AP Inter 1st & 2nd Year Results Date 2018: Andhra Pradesh Board of Intermediate Education (AP BIE) has successfully conducted the AP Intermediate 1st year and 2nd year exams recently. Students pursuing in the Intermediate 1st year and 2nd year have appeared for the academic examinations. The board has directed the examinations for lakhs of understudies in February and March months. Comparatively, the number of students was increased this year. As per the statistics, this year 5,30,000 students have appeared for the Intermediate 1st year examinations. The Inter first year exams organized from 28th February to 17th March. While the AP Inter 2nd year examinations were held from 1st March to 19th March. Approximately 5 lakh students have appeared for AP Inter 2nd year exams this year. The examinations were held across the AP state. The BIE AP to introduce the grading system in Intermediate from last year onwards. The board has decided to give 7 different gradings for the students. HRD Minister said that students and parents do not have to worry about new grading system. The decision was taken by the minister’s after discussed with inter board secretary B. Udayalakshmi and other officials. Students who have just completed the Intermediate board examinations are going to appear for various competitive examinations. For some examinations, students have to score above 75% marks and for some other exams, students require Inter board top 20 percentile. Based on these requirements, students have given the grading. The Andhra Pradesh Intermediate results are expected to release on 12th April, 2018 (tentatively). While the AP Board of Intermediate is going to introduce the new grading system from this year. 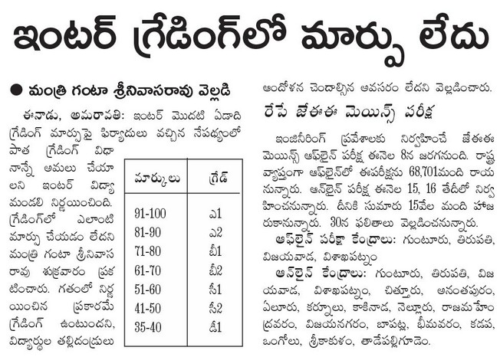 So, students can check the details of AP Inter Grading system from this article. Based on the marks acquired by the students the grades will be allotted to the students. The Grades ranging from A1 to D1. Within the specified range, the students will be allotted grade as the score obtained in the examinations. The AP Intermediate Grading process has implemented to control the student’s suicides due to the traditional marking scheme. The AP Intermediate results are expected on 12th April (tentatively). Grades of the students will also be announced with the result. Students can keep visiting the Board of Intermediate official website, bieap.cgg.gov.in to download the result and to check the grade. Is there any change in second year grade points? Are first and second year grades are averaged.?? are displayed. what about my physics paper. i have paid for two papers(2000). Sorry.we can't download our answers sheet.